I spent about 20 minutes total in the shopping madness that is Black Friday. Merchants anxious for my discretionary spending employed all sorts of lights and sounds to get attention, each one louder and brighter than the next. Digital impulses are gone in a flash, pushed out of our sight by more and more messages that demand our attention. The jumbled noise makes me long for a more sophisticated and lasting esthetic. I’m talking about the art of hand-painted signs. It won’t matter if the power goes out or it rains non-stop for days, these hand-painted signs will still broadcast the message creatively and effectively. I think what I like most is that we are encouraged to linger on the words, not tickled to click the flashing button or follow the link. The signs say, “Come in. Look. Buy.” A finely crafted sign can evoke an emotion just with the shape of the letter forms. 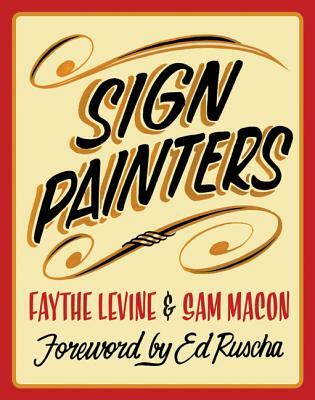 Sign Painters, written by Faythe Levine and Sam Macon not only shows the results of the craft, but highlights the craftsmen who employ the lost art of sign painting. Oh sure, it is romantic – hand painted signs. But sometimes you need a little heritage, a little permanence in a world of digital impulses to stand out in the crowd. So pause for a minute and appreciate the talents and skills of these craftsmen. Then BUY THE BOOK. There was a time-as recently as the 1980s-when storefronts, murals, banners, barn signs, billboards, and even street signs were all hand-lettered with brush and paint. But, like many skilled trades, the sign industry has been overrun by the techno-fueled promise of quicker and cheaper. The resulting proliferation of computer-designed, die-cut vinyl lettering and inkjet printers has ushered a creeping sameness into our visual landscape. Fortunately, there is a growing trend to seek out traditional sign painters and a renaissance in the trade. In 2010 filmmakers Faythe Levine, coauthor of Handmade Nation, and Sam Macon began documenting these dedicated practitioners, their time-honored methods, and their appreciation for quality and craftsmanship. Sign Painters, the first anecdotal history of the craft, features stories and photographs of more than two dozen sign painters working in cities throughout the United States. Elke is our chief facilitator — helping A/E/C clients uncover insights about customers and services to define a unique marketing position. She is equally at home in Dallas or Nashville, but oddly enough cannot two-step to save her life. When she isn't researching, interviewing or facilitating, she is practicing the delicious art of baking.